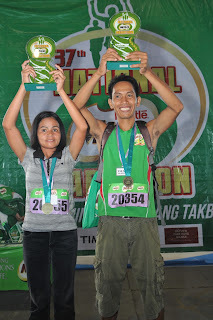 Eugene Postrado and Gemma Payong ruled the 21-K division run of the 37th National MILO Marathon Sunday in Naga City. Both runners received a cash prize of P10,000.00 and a trophy for their respective victories, but only Postrado earned himself a coveted spot in the National Finals on December 8. Of the 6,601 runners who competed in the race, 19 other male runners also qualified for the National Finals. The stakes are higher for this season’s MILO Marathon King and Queen, as they will be competing alongside elite runners from across the world at the esteemed Paris Marathon in 2014. 34-year old Postrado who has been running in the National MILO Marathon for over 8 years used the fair weather to his advantage, and crossed the finish line at an impressive 1:16:08, outrunning counterparts Martin Balaybo (1:18:12) and Marino Jr. Lagyap (1:18:36). Last year, Postrado was the 2012 all-Filipino category winner of the 10-K Mayon Trail Run and the second runner-up of the 21-K Xterra Trail Run. “I have been running for 16 years already, but this is only the second time I’ve qualified for the MILO Marathon National Finals. Qualifying for the finale is a huge accomplishment. I will continue to train hard and focus on my training regimen for the competition,” ~ Eugene Postrado. In the distaff side, 32-year old Payong clocked in at 1:48:53, way ahead of rivals Melissa Missy Hilario (1:55:43) and Ma. Jean Benito (2:05:53). Although the Naga-bred mother of four wasn’t able to secure a spot in the National Finals, she says she is determined to make a name for herself in the seasons ahead. Ernie Payong won the 10-K division run earlier today and finished with a time of 35:23.08. As an ongoing commitment to develop sports in the country, MILO’s Help Give Shoes advocacy provides pairs of rubber shoes to various public schools across the country. A total of 500 pairs were delivered to beneficiary schools today in Naga, namely San Jose High School, Central Bicol State University of Agriculture High School, Tinawagan Elementary School, Tigaon National High School, and Bonbon Central School. With the invaluable support of the Department of Education and the National MILO Marathon runners, MILO has given a total of 25,700 shoes to date. The qualifying race will resume in San Pablo on July 21, before taking its act to Manila (July 28), Iloilo (August 4), Dumaguete (August 11), Tagbilaran (September 15), Cebu (September 22), Cagayan de Oro (September 29), Butuan (October 6), Davao (October 13), General Santos (October 20), Baguio (November 3), Dagupan (November 10), Tarlac (November 17) and Angeles (November 24). The 27th MILO Marathon National Finals will then be on December 8 at the SM Mall of Asia grounds. Oo nga. I love the father and daughter shot. Inspirational. Good work Balut!